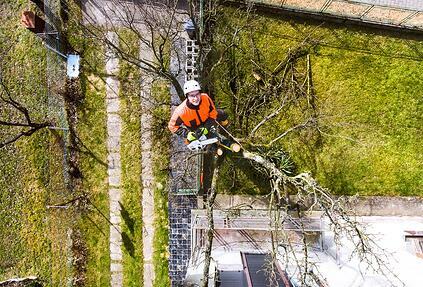 There are a lot of unscrupulous tree service companies out there who will say one thing but will do another. They’ll take people’s money, cut trees wrong and do more damage to the property than good. Their only concern is showing up and getting paid for the day. Yes, their under-bidding, low-balling and shady practices are hurting the industry but there is something you can do about it. In the tree industry, there is no systematic certification that lets homeowners know you’re better than the next guy (or the guy with a chainsaw and a pickup that probably doesn’t have insurance). Yet, there’s never been a time when separating yourself from these shady operators has been more important, feasible and possible. Is the guy with the chainsaw and pickup truck going to invest in insurance or invest the time and money in training to become an arborist? Will they bother to join Tree Care Industry Association? Are they going to invest in a good website, videos or marketing to get more qualified leads? NO. These guys aren’t thinking long term lifetime value of the customer. They don’t care about the customer, they only want to get paid for a days work. Unlike you, who invested in safety training, insurance, certifications, equipment, sales development, building your reputation and branding your tree service company. You care about the customer and want to service that customer for years to come, unlike them. If you want to close more customers and be able to charge top tier pricing on every job (which is possible) then you need to position yourself as an industry expert, a leader in the field. The more education, the more training, the more credentials you have, the more you are going to set yourself apart from the competition and the more you’re going to be able to command for your services. Join industry trade associations, get certified, take training courses and then display those credentials on all your marketing materials. This shows the consumer you've invested the time, the money and training to properly handle the job, safely and professionally. Though the industry seems to think the consumer is obsessed with the lowest price service provider, that’s simply not the case. If you’re marketing and selling your tree services correctly, then cost will not be a concern with your customers. What should be a concern to them is whether the job is done correctly, with quality results all while safeguarding the safety of their property and family. Homeowners will spend money if they know you’re a reputable company and the work will be done with quality standards the first time. Once the consumer is more concerned about a job being done right then they are about the price, you’ve done your job correctly. After all, taking down a tree is a lot more involved than just taking down a tree, people’s can be hurt, maimed or killed and property and equipment can all be damaged with one mistake.